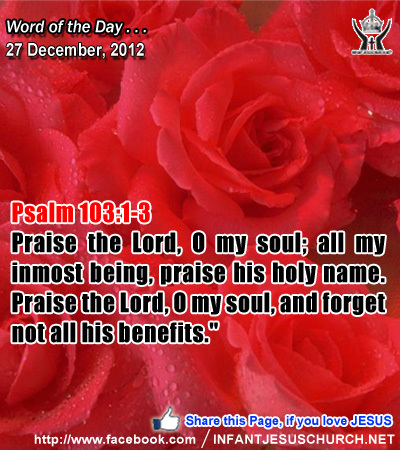 Psalm 103:1-3: Praise the Lord, O my soul; all my inmost being, praise his holy name. Praise the Lord, O my soul, and forget not all his benefits. Heavenly Father, we praise you for your gift of creation. We praise you for your love in granting us free will to admit or reject you. We praise you for choosing Abraham to be the foundation of faith and a people through whom Jesus would come. We praise you for sending to us Jesus. We praise you for providing the sacrifice for our sins. We praise for what you are about to do and yet remains enshrouded in mystery to us. We praise you for raising him from the dead and triumphing over sin and death. We praise you for those who shared the Gospel of your grace with us. We praise for what you are doing through us and for us. We praise because you are Almighty God who has chosen to be our Abba Father. In the name of Infant Jesus, we praise you. Amen. John was the earliest apostle to reach the tomb of Jesus on Easter Sunday morning. Like the other disciples, he was not prepared to see an empty tomb and to hear the angel's message, Why do you seek the living among the dead? What did John see in the tomb that directed him to believe in the resurrection of Jesus? It was surely not a dead body. The dead body of Jesus would have unconfirmed the resurrection and made his death a tragic end to a glorious career as a great teacher and miracle worker. When John saw the empty tomb he must have recalled Jesus' prophecy that he would rise following three days. Through the gift of faith John understands that no tomb on earth could contain the Lord and giver of life. Loving Infant Jesus, you have triumphed over the grave and you have won new life for us. Give us the eyes of faith to see you in your splendor. Help us to draw near to you and to grow in the knowledge of your great love and power.